GPT to showcase telemedicine capabilities to state government officials. 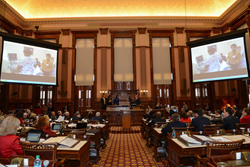 Georgia Partnership for TeleHealth (GPT), a charitable nonprofit promoting the establishment of telemedicine programs in communities throughout Georgia, announces its participation in the Georgia General Assembly’s “Doctor of the Day” program on February 24, 2015. GPT will demonstrate the benefits of telemedicine programs by connecting the Georgia State Senate and the Georgia State House of Representatives to a school-based telemedicine clinic at Turner County Elementary School and a new mobile ambulance clinic in Hancock County, GA.
Turner County Elementary School began their school-based Telehealth Center programming in 2013. Since then they have expanded that service to all three schools in their district with the help of Tift Regional Medical Center, several federal grants and the Turner County Connection, a part of the Georgia Family Connection program. Tift Regional supports thousands of telemedicine encounters each year and supports many community telemedicine initiatives such as the new Abraham Baldwin Agricultural College telehealth program and several School Based Telehealth Centers throughout the state. Officially launching in fall 2015, the ambulance clinic is the product of a collaborative effort between Mercer University, Hancock County, the Georgia Office of Rural Health and GPT. The ambulance clinic will focus on diagnosing acute issues such as sore throats and the flu, which will lead to fewer visits to regional hospital emergency rooms that are up to 45 minutes away for some county residents. EMTs will present patients for exams by a physician through a telemedicine “bag” located in the ambulance. The program will provide more immediate patient care, reduce overall transportation costs and allow time for EMTs to focus on actual emergency situations, which will also benefit from the direct physician telemedicine support during ambulance transport. Georgia State Senator Tyler Harper sponsored a Resolution in the Senate commending Georgia Partnership for TeleHealth on its superior telemedicine network within the state. For the full resolution visit the General Assembly's website. Georgia Partnership for TeleHealth is a charitable nonprofit corporation, which was formed to promote improvements in healthcare and healthcare facilities in communities by assisting in the establishment of telemedicine programs. GPT is known as the leading agency globally focusing on increasing access to healthcare through innovative use of technology. GPT is one of the entities that belong to the Global Partnership for TeleHealth. The mission of the Global Partnership for TeleHealth is to deliver worldwide access to healthcare. Our unparalleled success in the United States in applying telehealth programs and services has assisted agencies in providing cost effective, efficient, and high quality healthcare. For more information visit the GPT website at http://www.gatelehealth.org.